Again, apologies for the late posting. Last weeks challenge for Elzybells was a great sketch designed by Jeanne. For my card I have used one of the very cute penguins and coloured him in with Copic markers. I have changed the sketch slightly by cutting in out into a circle instead of a square using my Nestabilities dies and added to base with 3D foam pads. I have made the base by layering up Lilac CS with 'Lilac Spinkles' paper with the corners cut out onto a white card blank. Gem stones added to the corners to finish. Check out Elizabeth's blog for all the other DT designs and the challenge for the 1st October. STAMPS: Elzybells Art Stamps. INK: Airondack Pitch Black. CS: Craftwork Cards, Doodlebug Designs, patterned paper by Doodlebug Designs. ACCESSORIES: Nestabilities dies, Papermania Adhesive Gems, Copic Markers, EK Sucess inverted circle punch. Awww, so cute!! Love him in purple! 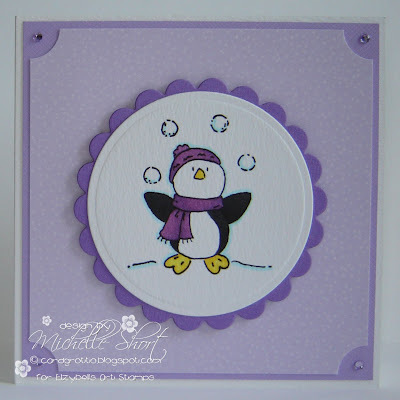 ...... Another stunning card Michelle and such gorgeous colours too. Michelle, there is an award for you on my blog. I love penguins and he's so cute!!! Purple suits him! What a cutie! Love the colours & fab lil penguin!!! Really cute! Love the colour!